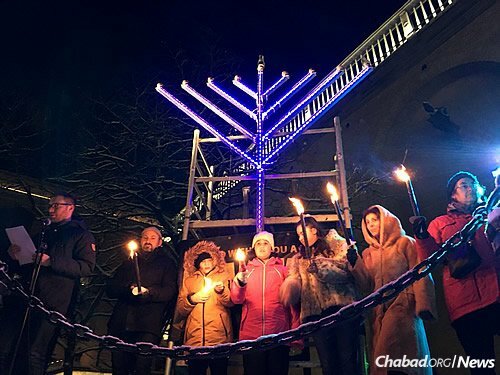 Hundreds of people—Jews and non-Jews alike—gathered in Gothenburg, Sweden, just days after a local synagogue was firebombed to light the menorah on Dec. 12, the first night of the eight-day holiday of Chanukah. 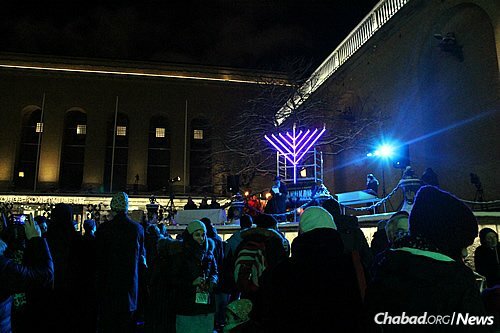 Braving ever-present security fears and the bitter-cold night air, hundreds of Jews and non-Jews descended on Götaplatsen, a central square in Gothenburg, Sweden, on Dec. 12 to witness the lighting of a giant Chanukah menorah on the first night of the eight-day holiday. The celebration, organized by Rabbi Alexander and Leah Namdar, co-directors of Chabad Lubavitch Sweden, has been held in Gothenburg for the last 27 years. But this year, the event came just days after masked men attacked a Gothenburg synagogue with Molotov cocktails. 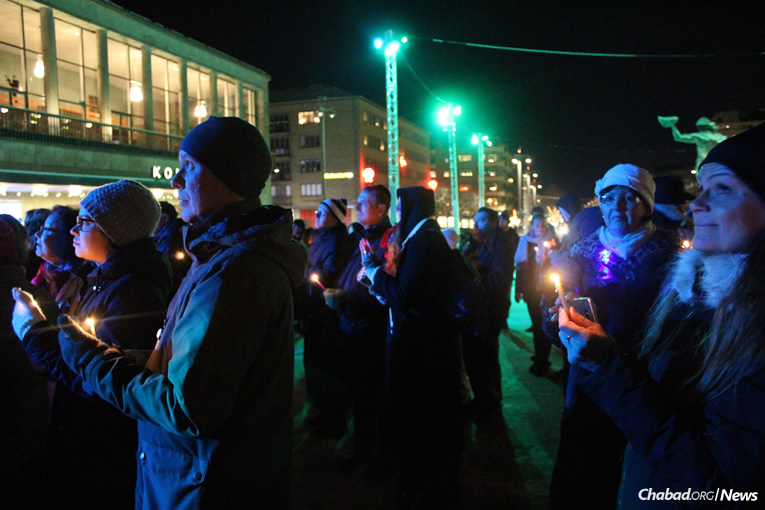 Mayor Ann-Sofie Hermansson joined the Chanukah festivities and addressed the crowd, vowing that Sweden must remain a safe home for its Jewish citizens. On Dec. 9, about nine men clad in black attacked a synagogue in the center of Gothenburg—not far from where the menorah is lit each night of Chanukah—and assailed it with explosive devices. As the courtyard caught fire, participants attending a Jewish youth group event inside the synagogue hid in the basement. An unexpected torrent of rain and hail (“miraculous,” says Namdar) extinguished the fire almost immediately. By the time Swedish police arrived, the attack was over. The next day three men were arrested, one of whom has been released but remains under suspicion. At the event, eight community members formed a human menorah, spreading light to the world. Mayor of Gothenburg Ann-Sofie Hermansson attended, addressing the crowd and vowing that Sweden must remain a safe home for its Jewish citizens. While Swedish officials have been reticent to label the latest attack on Jews as anti-Semitism (a police spokeswoman told The New York Times on Dec. 10 that while “it might become a hate crime,” for now it is being treated as “attempted arson”), a 2013 report by the European Union Agency for Fundamental Rights shows that a full 79 percent of Swedish Jews avoided identifying themselves publicly as such all the time, frequently or occasionally. Following the attack, police have been guarding Jewish centers around the city, including the Chabad House, and a notable police presence was out in force for the public menorah-lighting. It’s not just anti-Semitism from a growing Muslim-Arab population (The Local reported that of the men detained in the synagogue attack, one is Palestinian and two arrived from Syria in recent years) that troubles Sweden’s 15,000-strong Jewish community. 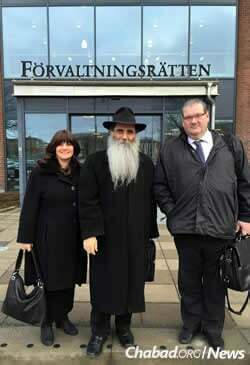 Rabbi Alexander and Leah Namdar, co-directors of Chabad Lubavitch Sweden, with their lawyer, Ulf Tollhage of the Nordia Law Firm. The couple has been involved in an ongoing legal battle for the right to homeschool their four youngest children. For the last six years, the Namdars have been embroiled in a conflict with Sweden’s Ministry of Education, which has been attempting to force the rabbi and his wife to send their four youngest children to municipal public schools. The children attend the Shluchim Office’s Nigri International Shluchim Online School for children of Chabad emissaries worldwide and take private classes at home, providing them with a full general and Jewish education. By all accounts well-adjusted and happy children, they enjoy their life as Chabad representatives and the schooling they receive. On Dec. 1, the third such case brought against the Namdars by Swedish officials was heard in a city courtroom. This time, the ministry of education is hoping to retroactively fine the couple one-and-a-half years, totaling $120,000. The rabbi and his wife, both qualified educators, were sent to Sweden in 1991 by the Lubavitcher Rebbe—Rabbi Menachem M. Schneerson, of righteous memory—to open the first Chabad center in Scandinavia. The parents of 11, their older children all work in the field of Jewish education and outreach. In 2011, a new law—aimed at the hundreds of thousands of refugees Sweden had welcomed in (the most per capita of any European nation)—was passed restricting homeschooling, yet specifying that the practice would be allowed in “special circumstances.” At the same time, the law stated that religion does not fall under that exception—nor, it seems, does physical safety or emotional well-being. “If religion and safety are not ‘special circumstances,’ then what is?” presses Leah Namdar. Additionally, she emphasizes the point that her children are by no means exclusively homeschooled and attend the online school daily. The Namdars were summoned by government authorities in the winter of 2011 and fined. A lower court ruled against them, but they appealed and won in the city’s Administrative Court of Appeal. That victory was overturned by a higher court, and proceedings were once again launched against them by the Gothenburg city council in the beginning of the 2014 school year, with their first hearing being scheduled for the morning before Yom Kippur. Each of the cases included a fine of 2,000 Swedish Krona ($237) per child, per parent, per week. That second proceeding was withdrawn by the city council due to a technicality—the fine having previously being issued against regulation. Now, court case No. 3 is proceeding (Cases No. 4961-17 and 4693-17), and Gothenburg city officials have requested to fine the couple retroactively. 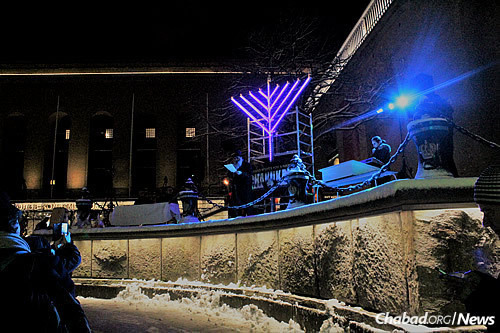 The Chanukah celebration has been held in Sweden for 26 years, though it was marked by concern and insecurity this year as attacks against Jews have grown. Throughout the court cases, Swedish educational authorities have acknowledged that the Namdar children receive an above-average education at home. At the same time, the Namdars have maintained that denial of their religious rights is against the Swedish constitution, the United Nations’ Universal Declaration of Human Rights and Article 9 of the European Convention on Human Rights, all to no avail. Grateful for the support that they have received from the broader Jewish community, the Chabad couple says they will continue fighting for their rights and those of others. At the Chanukah event where Gothenburg’s mayor urged the Jewish community to remain in Sweden, music was played by the couple’s 14-year-old daughter, Sara, one of the children listed in the city council’s educational case (the mayor serves as head of the city council). At the lighting, eight community members held torches, forming a human menorah. Each one spoke about the Jewish message to the world—and to Sweden. “There is a Chassidic teaching that one must ‘listen to the flames of the menorah,’ ” says Rabbi Namdar. “Each and every person is a flame; we are a living message, and we cannot and will not just go away. Click here to help support religious freedom in Sweden. The Soviets tried this as well as China which did not work out to well...." We are all 'equal' just some are more 'equal' than others"...Animal Farm .